Hi there readers I hope your all well after looking at the stats we noticed that royal doulton bulldog came up a lot so I thought I’d remind people that Collectibulldogs has already done some work regarding royal doulton bulldog memorabilia. So it seems that royal doulton bulldog is still the top of every collectors wish list Our articles on RD bulldog memorabilia could help you in more than way, for example you could of paid hundreds of pounds and received your piece but wondering why the royal doulton part is crossed out there’s other info too. We also produced an article looking at the differences between the Royal Doulton Bulldog and those made in Denmark by Royal Copenhagen, both have their loyal fans yet Royal Doulton took up life in America thus making the Royal Doulton collecting even bigger where as royal Copenhagen pieces only started getting to collectors properly when the internet started. Here you can decide which version you prefer if your not a collector of either the different makes and models should help you choose if you like the stubbornness of the royal doulton bulldog or wether the soft pastels of the Copenhagen pieces take your fancy, I have stated my preferences on the article just read away and see if you agree. 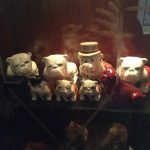 Collectibulldogs has done very well with Royal Doulton Bulldog memorabilia it’s true we do not have quite as many as some other collectors and we have our reasons but there’s a cabinet here with about forty or fifty pieces ranging from K1 and K2 up to the sets and flambé pieces. 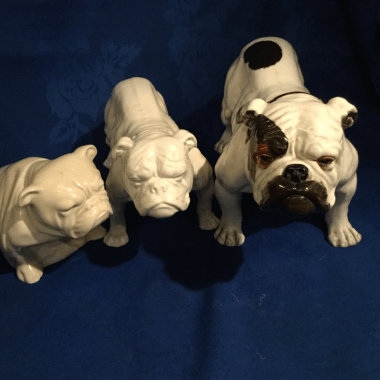 There was not much love for royal doulton bulldog memorabilia when I first started there were pieces advertised when I was searching but at the time I felt like getting in other pieces as more important it was not until I started getting asked about them I saw the interest. Our lastest couple of pieces I’m very proud to of obtained HN 881 was funny when it arrived as the amount paid had my wife thinking it would be of the larger size ! 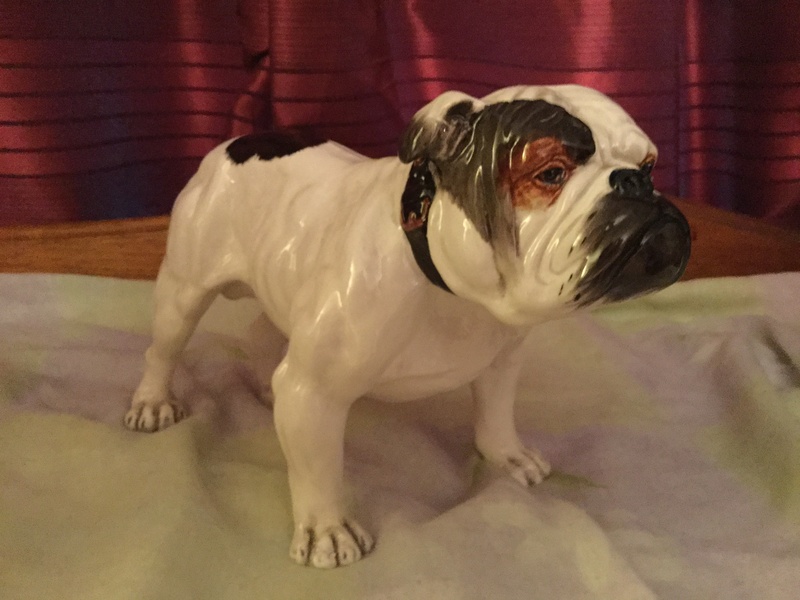 I knew it was no bigger than royal doulton smaller bulldog figurines and even came in a large box giving the same impression, below is a picture of our other amazing purchase. your looking for a lustre ware Royal Doulton Bulldog pot with what looks like HN 881 sitting on the top, it’s hard to say what size it would be nor is there any information on just how many were produced, Royal Doulton were known to do rarities and concept pieces maybe this piece falls into that category. If like a few of my friends you have tonnes of Royal Doulton or just a few pieces really enjoy them the fact the prices go up and down shouldn’t matter to the true collectors yes we all want a bargain but as a collector myself I know how easy it is to get drawn into this quite expensive world. Save if need be if your after a Royal Doulton Bulldog piece they do feel like you’ve reached the top when you see them displayed on the shelf, Royal Doulton have made it easier for everyone to enjoy their pottery they were involved with the James Bond franchise Check out the article see the more affordable pieces two were from the skyfall and spectre films but you can buy others that were bought out over the past few years. Theres many places to find and look for Royal Doulton you can try either online auction sites or actually go to auctions with advanced warning there will be pieces there INVALUABLE is a great place to join they send you email alerts to your keyword preferences there’s also social media with various groups from identifying to buy and sell. Advertising is a good way to get attention Royal Doulton sellers want the best prices and will be active in finding new clients there’s tonnes of wanted groups and in papers and other smaller directories for example we have the Friday ad in the U.K. where anyone can place an advert, word of mouth too is another way to finding pieces just ask others for a little information on where they acquired theirs.